Getting Kik for iPad is basically the same as getting Kik for iPhone. The only difference is that the iPad version of the app (which is the same as the one for iPhone) will look a bit less premium since it was never specifically optimized for functionality on the Apple tablet computers. However, it works and it’s still one of the best messenger apps out there. So to answer the question “Is Kik available for iPad?”, yes and no. Firstly, Kik is installable on iPad. You can simply download it from the iTunes App store and it will work just fine. However, a Kik version that is specifically designed for iPads does not exist. Why the developers have chosen not to build one is a mystery. And one we will try to go into over the course of this article. We will also show exactly how the iPad Kik app can be downloaded and what its features are. Why Isn’t Kik for iPad Available? The simple answer is: we don’t know. Back in 2013, Kik’s FAQ page updated with a question about this specific issue. A fictional user asked if Kik Interactive was going to make a Kik App for iPad that would be different from the iPhone version, preferably optimized for a larger screen and with more features on the same page. There is no Kik for iPad. This was back in 2013, and it’s still the case as of 2016. Kik is focused on smartphones. The original idea of Kik Messenger was to provide a more intuitive messenger for the generation of smartphones. Kik doesn’t have plans to build an iPad version. Kik Interactive also said that they won’t be making any version for tablets. Kik doesn’t say no to the possibility. Next, Kik Interactive mentioned that one can never know what the future will hold. Basically: maybe they will make a version for iPad, or maybe they won’t. 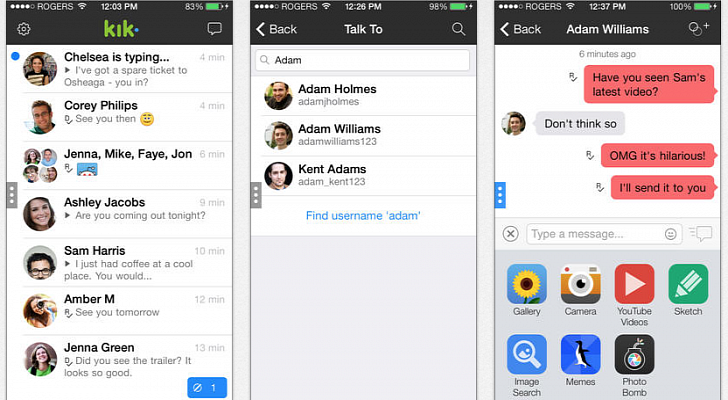 Kik recommends users to the iPhone version. An important fact at the end of this answer by Kik customer support. This means that they themselves have tested the iPhone version of Kik for iPad functionality. This also means that other tablets, such as Android or Windows Phone ones, should be able to run Kik for smartphones. In order to get Kik download for iPad, all users must go through a set of easy to complete steps. Remember that these steps will not grant you access to an iPad specific Kik Messenger app, but rather to an iPhone version of the app, yet installed on your iPad. Go to the App Store. Open up your iPad and load up the App Store. Select iPhone Apps. If you don’t do this step, the Kik app for iPad will not show up. Search for Kik Messenger. Use the search box to the top right corner of the app to look for Kik for iPad. Install the app. After you’ve found the iPhone version of Kik, click install and the app will be transferred to your device. Open Kik for iPad. That’s it! You have succeeded to download Kik for iPad. Log in with your Kik account and let the fun begin. If the app is too small for your screen, you can magnify it by pressing the 2x button to the bottom right corner of the screen. Why Is Kik for iPad Different? Internet messaging. Users can make use of their data package to send and receive messages. Back in 2009, this was a major breakthrough as it allowed users to use their phones like never before. Essentially, they could now bypass that incredibly specific message limit that they were allowed to send before getting charged. Finding new people. Built by the smart for the lonely, Kik has a feature that can be considered rare: it allows users to search for other users only by using common preferences and interests. Essentially, it allowed friendships to be made in an easier way. Sharing photos and videos with friends. One of the first messenger apps to introduce group conversations, Kik also allowed these friends to share videos and photos of their experiences instantly. While this feature is extremely common now, Kik Messengers was one of the first apps to include it. Sharing games. Kik includes a great number of mobile video games that can be played by friends at the same time through the app. Adding real life friends through the Kik code. Essentially their own QR code system, Kik allows friends to quickly add each other to the messenger list through the Kik code. This code can be scanned with the camera and then the person just pops up in your list! These are far from all the cool features presented by Kik. It’s simply more than you will get with other, more conventional messenger apps. If you like what you see and have an iPad, be sure to try the Kik for iPad trick that we’ve detailed above.